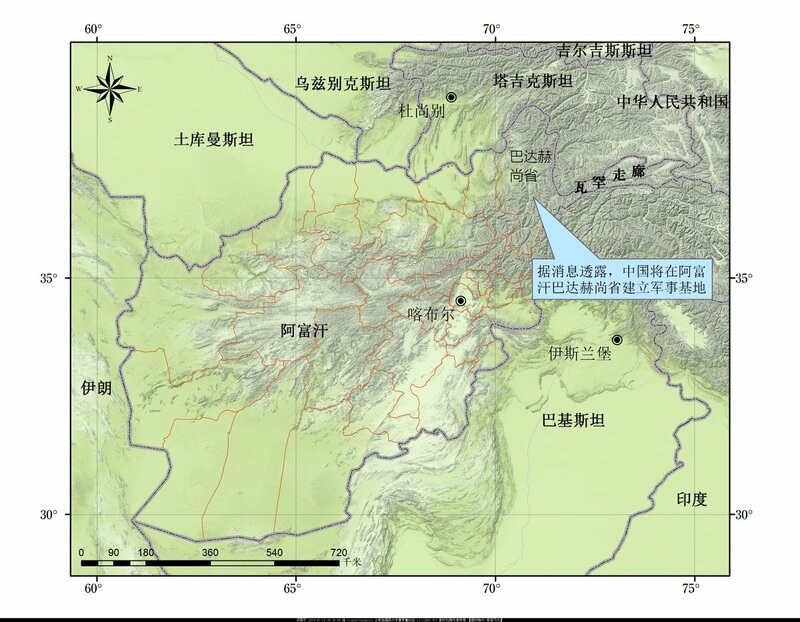 If the Chinese map is accurate then the the base is right in the middle of Taliban territory, where the blue dot is. Between Baharak and Yamgan, on a mountain ridge overlooking the valley below. Yes, that map. I think you misunderstood the "blue dot". Its in the middle of the crosshair right of the green face. Not the blue loudspeaker icon. I marked a "blue dot", its actually a polygon, perhaps too small to be seen clearly, it looks like a small body of water. Correction: the location is supposed to be 10km south of where I marked. According to the key, green means Taliban territory. I really don’t see how this qualifies as a ‘Chinese base’ given that it will be manned by Afghan government forces. Can you guys provide a link to the map? "Over the past 96 hours in Afghanistan, the aircraft played a leading role against the Taliban, striking the militant group's training facilities in Badakhshan province with 24 smart bombs, U.S. Forces-Afghanistan said in a release." Russian news agency Ferghana News, which focuses on Central Asia, has reported that China will build the base in northern Afghanistan. The report was picked up last week by U.S. magazine The Diplomat and then in Chinese state media. Speaking at a regular news briefing, ministry spokesman Wu Qian said that the two countries had normal security cooperation and that China like other countries was supporting Afghanistan in defense and counter-terrorism. “The so-called issue that China is building a military base in Afghanistan is groundless,” Wu said. China has long been concerned that instability in Afghanistan could spill over into the violence-prone Xinjiang region in China’s far west, home to the Muslim Uighur people, where hundreds of people have died in recent years in unrest blamed by China on Islamist militants. China opened its first overseas military base, in the Horn of Africa country Djibouti, last year. China has previously denied having plans for other overseas bases, but the United States expects China to build more, with Pakistan a likely location.